I simply can’t get enough of creating flower patterns. I am very pleased to Introduce Laeliocattleya Mossaie Orchid, another delicate and delightful flower. 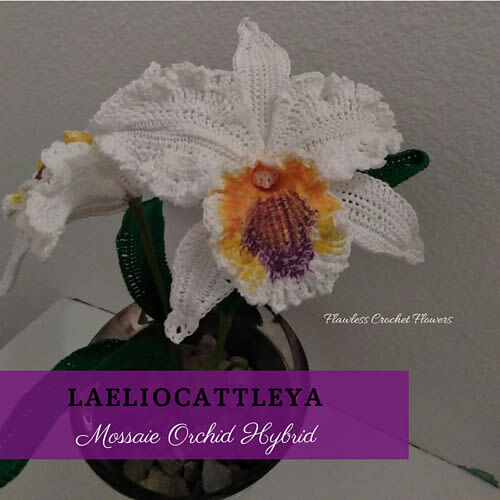 Laeliocattleya orchids are beautiful and this easy Orchid pattern is a big blooming beauty with a flower head of 6 1/2” diameter. Go beyond your imagination with the so many colors they grow in using these step by step crochet instructions that has many images to guide you along your journey. With this pattern, you can easily create your favorite from pinks to reds,purples to orange, yellow and of course the white as I’ve created here. Stands 14” tall and can be made taller or shorter by simply altering the size of the wire used in the flower pattern.